I met wonderful Rebecca Petruck a few years ago at a novel writing retreat, and have been fortunate enough to cross paths with her several times since at writer events. I’m thrilled to share that her debut novel, STEERING TOWARD NORMAL, forthcoming from Abrams in May, is already making a big splash as an American Booksellers Association Indies Introduce New Voices selection and a Spring 2014 Kids’ Indie Next List selection. Knowing Rebecca, this doesn’t surprise me at all. 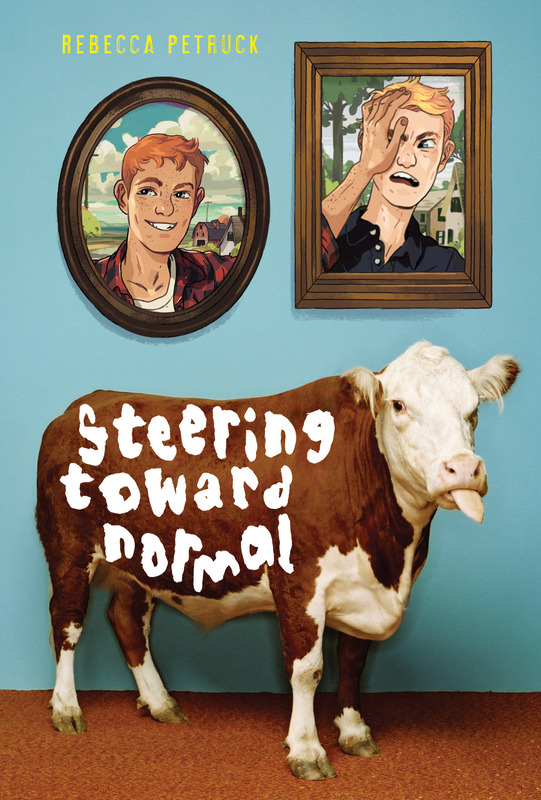 STEERING TOWARD NORMAL is the story of eighth grader Diggy Lawson and the year he attempts to compete with a calf in the Minnesota State Fair — the same year Diggy’s family life is turned upside down when a half-brother he didn’t know he had moves in with he and his father. You can read a more about it HERE! 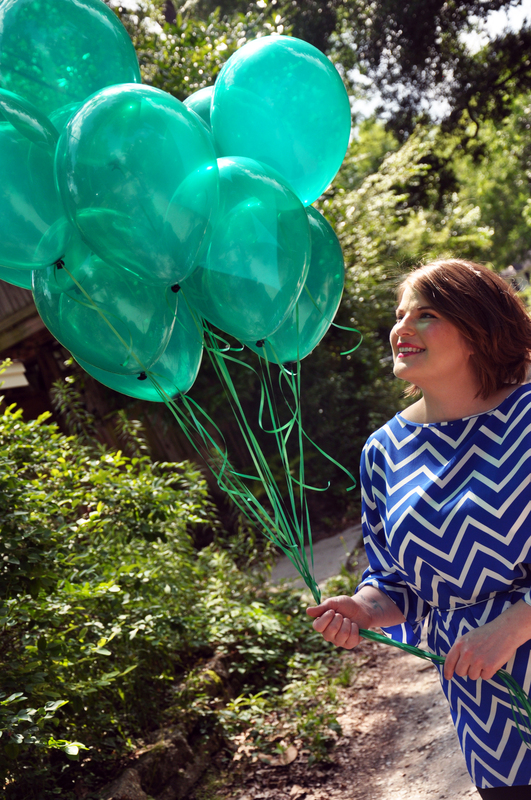 But first, check out Rebecca’s great answers to these three questions. Thanks for joining us today Rebecca! 1. I always think the best books touch readers on an emotional level. How will readers connect with your main character, Diggy? Diggy thinks he’s a tough guy but is all heart. Diggy’s mom left him as a baby in a very public way that has become part of the town lore, so her absence is always present for him. He pretends it doesn’t hurt, especially because he has a good situation with his dad, but it never leaves him. So when something happens that seems to threaten Diggy’s relationship with his dad, he’s not as prepared to deal with things as he thinks he is. Which, frankly, I think is pretty true for all of us. What ends up helping Diggy most is something that hurts him, too. He raises and competes show steers. Competitors spend several hours a day every day with their animals, and the steers become like a beloved pet. But a steer is only and ever market beef. Every year, the steers, especially champion show steers, are sold to the packer and slaughtered. Why would kids do this year after year? Fall in love with an animal and care for it as a best friend, knowing it will be sold? What I heard from all the competitors I met over the years is that it is the cycle of life, and that they had a year to love the steers and give them a better life than what they would have had on a feed lot. Despite the pain—loading day is called the “Day of Tears” for a reason—the kids cherish the time they have with their animals. Approaching a situation like this year after year and learning how to cope with the heartbreak has prepared Diggy to cope with other difficult situations. He doesn’t realize it, of course, and there are times when he wants to give up, but raising steers has taught him how to keep his heart open, despite the inevitable pain, and that ends up being the gift he shares with and that saves his family. 2. What’s something you like to do that might be considered a tiny bit nerdy, but is actually really fun? I love to work with paper. I’ve long collected beautiful paper, and I have drawers of pages ripped from National Geographic magazine. When a close friend died suddenly from cancer, I organized a project to fold 1,000 origami cranes, in the tradition inspired by Sadako Sasaki, and I folded most of them from the Nat Geo pages I had saved. I also love paper engineering and have tried my hand at learning basic paper construction. One year I folded book bursts for holiday gifts for everyone. 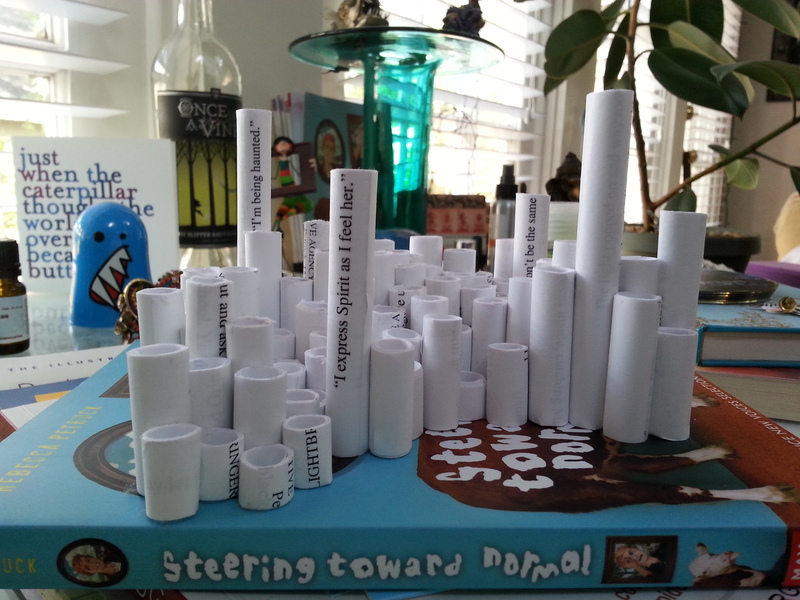 And in playing with all the manuscript pages I recycle, I’ve been slowly building a cityscape from paper tubes [image included]. I’d really like to try book sculpting, too, and I aspire to own a piece by Su Blackwell one day. I love art because to me it is another kind of storytelling, and the pieces I collect personally all have something to say. So I’m particularly thrilled and inspired by the blending of books, paper, and art. Because the paper art I enjoy also has a technical component (folding, cutting, building), when I tinker with paper and books it is like putting my brain on notice that both sides have to do their fair share of the work. 3. You’ve been a cheerleader, but also love books and have participated in math competitions! Do any of your characters have nerdy sides? I think the real question is, “Do any of your characters try to be ‘popular’?” All of my characters are geeks and nerds, even the ones who don’t think they are, just like me. I approached cheerleading with the same nerdy determination I approached Mathcounts, 4-H, and sticker collecting. The thing about cheerleading was that I thought it would “legitimize” me in some way by proving to people I could be “cool.” What I learned, though, was that I was already cool. I had great friends and made more friends, not because I was a cheerleader but because I let them get to know me. I had been intimidated about talking to certain people because I had put them above me in my own mind, not because they had put me lower in theirs. It was a good thing to learn in eighth grade because by high school I was over it. Sure, there were people I was nervous about talking with—mostly very cute boys—and most of my friends were theater and choir geeks because theater and choir are AWESOME. But my best friend was a “guidette,” and I had friends from a variety of groups. Though the groups definitely existed, they just weren’t that important for a lot of us, and I think that is even truer for students I see today. Those answers were so great that each one could have been its own separate blog post! I can’t wait to get my hands on a copy of Steering Toward Normal. To find out more about Rebecca, visit her WEBSITE, particularly her Creativelings page where she maintains a haphazard list of things she finds interesting. Fair warning: If you follow Rebecca on Twitter or Facebook, you will find yourself sucked into the many interesting articles she posts! Thanks again Rebecca. We’re looking forward to seeing STEERING TOWARD NORMAL out in the world. 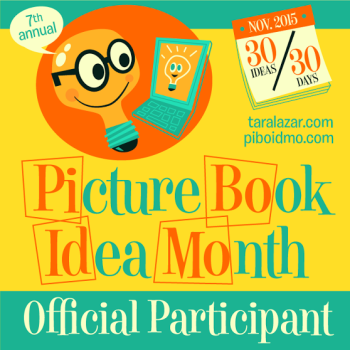 This entry was posted in Nerdy Chick Interviews, Three Questions With and tagged 2014 debut, Indie Next, middle grade novel, Rebecca Petruck, Steer Competition, Steering Toward Normal. Fascinating, real and thoroughly inspiring! Wishing Rebecca so much success with this book! Thanks for inviting me to be a Nerdy Chick! You rule! Great interview, Kami and Rebecca! Much success with your book. Great interview, Rebecca! 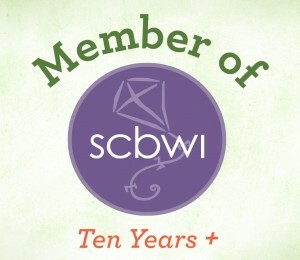 You are definitely one of the most interesting, paper-creation, cheerleading, writerly geeks I know! Looking forward to your debut, Rebecca! Thanks, Kami, for introducing us. Terrific interview. Terrific! Love the paper hobby! Very interesting interview. Thanks for sharing. “Wouldn’t we all like to steer a little towards normal?” Fun title and great plot. Thanks for the wonderful interview. Thanks Joan! I’ll make sure Rebecca sees your comment!